Mac's has a deal on right now. 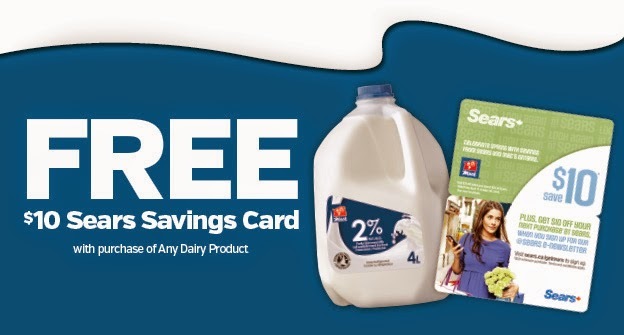 Purchase any Dairy product at Mac's and receive a FREE Sears Savings Card. You can use your Sears Savings Card online or in store for $10 off your purchase of $25 or more! I went and got a 4 Litre bag of milk for $4.99 and went shopping at Sears. I picked up myself a pair of nice black stretchy pants and a nice black skirt. These cards won't last long so you will want to pick yours up ASAP. This offer ends April 27th or while quantities last. Also if you sign up for their newsletter you become a VIP and will get freebies once in awhile. They will email you the newsletter and there will be deals and a free printable coupon for a free product. Who doesn't like FREE! !